Various - Americana Country Music - 7", EP - USSR - Rare! Georg Jensen: The Danish collection dessert sterling SILVER year spoon, 1974. Georg Jensen: The Danish collection dessert sterling SILVER year spoon, 1982. Georg Jensen, Denmark: 2007 Collection dessert spoon. Silver, gold, enamel. Georg Jensen: The Danish collection dessert sterling SILVER year spoon, 1975. Georg Jensen: The Danish collection dessert sterling SILVER year spoon, 1972. Georg Jensen: Danish collection dessert SILVER year spoon, 1985. Georg Jensen: The Danish collection dessert sterling SILVER year spoon, 1981. Georg Jensen: The Danish collection dessert sterling SILVER year spoon, 1992. Georg Jensen: The Danish collection dessert sterling SILVER year spoon, 1978. Georg Jensen: The Danish collection dessert sterling SILVER year spoon, 1998. Georg Jensen: The Danish collection dessert sterling SILVER year spoon, 1994. Georg Jensen: The Danish collection dessert sterling SILVER year spoon, 1979. Collection of 6 sterling silver spoons 1976. Georg Jensen, Denmark. 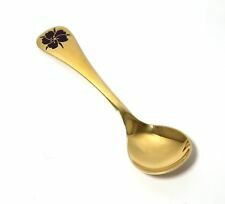 Georg Jensen: Six annual dessert spoons "Woodruff" 1975, Denmark. Georg Jensen: Six annual (year) dessert spoons "Corn Cockle" 1974, SILVER​. Collection of 6 sterling silver spoons 1973 - 1978. Georg Jensen, Denmark. Georg Jensen: The Danish collection dessert sterling SILVER year spoon, 1973.